Here's something new I tried this week. Very nice! I always enjoy to see what new patterns people create for their mandala's. This is called a mandala. It's art for spiritual practices. They remind me of Mandalas (and a drawing of my own). Very well done! 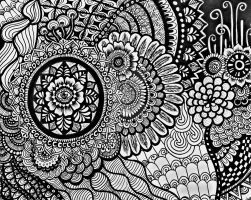 I think its a kind of zentangle. Did you free-hand the circles?